Emily's Recipes and Reviews | UK Food Blog | Leicestershire : 48 hours in liverpool. A few foodie days in Liverpool, a couple to be exact. With Travelodge Liverpool Central The Strand as our base for our staycation, I jam packed lots of food related adventures (and some not so foodie) for us to do during our stay. Every food blogger knows it's impossible to go anywhere without a little bit of Twitter research. So from secret bars and sushi platters to pork chop sandwiches and pretty cocktails, hopefully there's something for everyone in my little guide. There's no denying that Travelodge are a budget hotel chain, offering simple, great value, no-fuss rooms with everyday essentials. No spa treatments or avocados on toast here. Instead, the perfect hub for a good night's sleep and clean facilities inbetween city exploring - which the staff are happy to give advice on too. The main draw with the Liverpool Central on The Strand is without a doubt the location and views of the Albert Docks, with Liverpool One, Tate and the city centre just a short walk away. Whether you're here for a cultural break or shopping till you drop, this Travelodge location is just the ticket for discovering this brilliant Northern city. Check in: 3pm. Check in at Liverpool Central on The Strand is at 3pm. We drove so parked our car at Liverpool One around the corner (L1 8LT) with a short walk to the hotel. With the hotel discount it works out at £10 a night - just go into the car park as usual and get a special additional ticket from reception. After a speedy and friendly service, we were soon in our super clean room, where we ditched the bags in favour of exploring and shopping. Dinner: 7pm. Mister Miyagi. Pork belly buns, sashimi on ice and extra crispy gyoza can be found at this Japanese gem. Where? 77 Bold Street, Liverpool, L1 4EZ. What to order? Steamed hirata buns with a delicious filling of your choice. After a peaceful night's sleep and all you can eat breakfast, it was time to go back out and discover Liverpool. We'd spent the day before in Liverpool One so this day called for the more indie and vintage shops of Bold Street. This street is a must for lovers of quirky homeware, retro clothing and cute independent cafes. Lunch: 1pm. Maray. Small plates are Maray's thing. Here you'll find vegetarian, meat, fish and vegan dishes alike, featuring perfectly presented seasonal ingredients. They also do a mean coffee. What to order? Whipped goat's cheese crostini and their fries with houmous and green chillies. We spent the afternoon along Bold Street, before heading to the Tate to check out the latest exhibitions. At the moment they are featuring a Matisse in Focus which showcases the famous The Snail (L'Escargot) piece from 1953. It's on until May 2016 - so I urge you to go check it out! Cocktails: 6pm. Berry & Rye. Psstt... Hidden away just a stone's throw from Bold Street you'll find an unmarked door with very special cocktails beneath. Or perhaps you won't find it... who knows? Where? 48 Berry St, Liverpool, L1 4JQ. What to order? Aviation; Sipsmith Gin, Maraschino, sugar and fresh lemon, shaken. Dinner: 7pm. Slim's Pork Chop Express. Mixing flavours of China with their infamous pork shop sandwiches and low and slow meats. Trust me, it works. Also if you're a fan of Big Trouble in Little China, this place is a must. Where? 85 Seel St, Liverpool, L1 4BB. What to order? Their pimped out fries which come in a bamboo steamer. 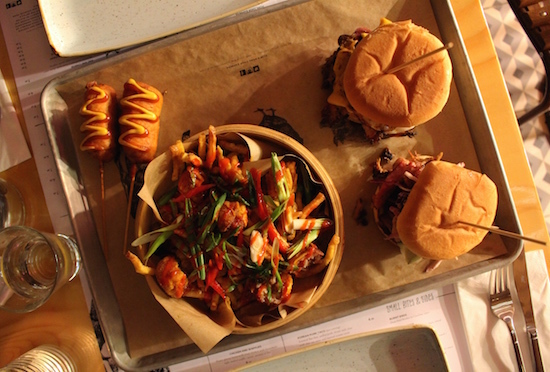 Think Philly steak, chilli cheese and curry sauce, char siu and sriracha fries. For the evening, The Cavern Club is must. With locals and tourists alike, the place is bustling with charm and live music. In my opinion it doesn't feel touristy or cheesy at all and everyone is there to have a good time. The Cavern Pub across the road has more memorabilia so I'd recommend going there in the day. Lunch: 12pm Bill's. As a chain in most big British cities, there's nothing new here. But I really do love Bill's and find myself coming back here wherever I am. The Liverpool restaurant is in the perfect location for lunch before leaving, since it's just a couple of minutes away from Travelodge and the car park. Where? Liverpool 10, 1 Thomas Steers Way, Liverpool, L1 8LW. What to order? Eggs Florentine and a pot of Earl Grey. Everytime. Having been to Liverpool a few times including my birthday, I thought I'd throw in the afternoon tea at Hard Day's Night Hotel too - a must for tea and cake lovers! The Travelodge is the ideal location for discovering what Liverpool has to offer, with rooms starting as little as £38. Not bad, eh? Have you ever been to Liverpool? What are your favourite places to go, drink and eat? You can also find some really cool Liverpool recommendations plus a fun competition over on their Evolving Cities interactive timeline! Post in collaboration with Travelodge. This looks like the most fun weekend! I've had Liverpool on my radar for a while but never nailed down a time to actually go. We're foregoing a big holiday this year but I want to plan in some little trips so I think Liverpool might have to be up there. I've never been to liverpool - certainly going to take these foodie recommendations on board! This is really useful. Ed's sister in in Liverpool and we really need to pay her a visit.